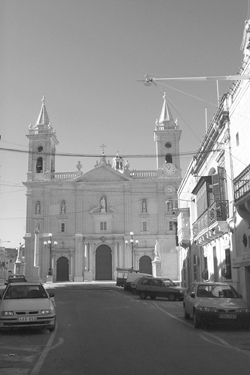 Information: Qormi was one of the ten parishes which already existed in 1436; twenty years after this date a new church was built by the parish priest of that time, Fr. Julius Lombardi. The present church was built in 1584. Other information on churches under this parish: Victory Church The church is mentioned in Mgr. Dusina's report as being dedicated to the Virgin Mary, but from 1588 the church became known as the Victory church; for a long number of years it remained closed because of its ruinous condition but was rebuilt in 1686. Priest in charge Archpriest Holy Masses Sundays and Feast Days: 7.15 am Weekdays: 7.00 am Holy Family Chapel Priest in charge Archpriest Holy Masses Sundays and Feastdays: 6.30 and 8.15 am Saturday Evenings: 6.00 and 7.30 pm Weekdays: 7.45 am Church of Our Lady of “tal-Hlas” (childbirth) From time immemorial in the locality there was a church which was always a centre of popular devotions. In 1560 a new church was built, but the Treasurer of the Order of St. John, Fra Christopher Mangodoin, in 1690 substituted it by the present church. Priest in charge Archpriest Holy Masses Every third Sunday of the month at 4.30 pm St. Peter's Church The chuch was built in 1656: today it is used for Perpetual Eucharistic Adoration. St. Catherine's Church The church was built in 1678 on the site of an older church mentioined by Mgr. Dusina in his report: today it is kept closed. Annunciation Church It is a small church adjacent to the church of St. Francis de Paule; it was built several times, the last being in 1798; today it is not in use. Church of St. Francis de Paule The church is not far from the parish church of St. George, in fact it is in the centre of the village. The administration of its property is of lay patronage. The church was built in 1707 by Francis Casha and his son Rev George Casha who were so authorized by a decree of Bishop Coccopalmieri dated 22nd January 1707. Ta' Qrejca Church Built in 1575, it is kept closed today. Formerly the popular pilgrimage to the seven churches dedicated to the Assumption of the Virgin Mary ended in this church. St. Mary's Church Tal-Blat (of the Rock) The church, mentioned by Mgr. Dusina, was rebuilt in 1644: today it is use for catechetical instruction. Cemetery Chapel of the Resurrection The chapel was built in 1991. A Holy Mass is celebrated at 10.00 am every Monday of November.